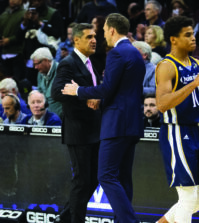 The Quinnipiac men’s basketball team battled a back-and-forth tilt with Boston University right down to the finish. In a game that saw 12 lead changes and 13 ties, the outcome was in question right until the final horn. Unfortunately for Quinnipiac, the ball didn’t bounce in its direction. Evan Conti rimmed out a three-point attempt with 12 seconds left and the game tied, then D.J. Irving drilled a three from the top of the key with 2.5 seconds left, securing the 69-66 victory for the Terriers on Monday night at the TD Bank Sports Center. Irving dribbled the ball up the court in BU’s final possession, realized Shaq Shannon had given him some space, then stepped into the 3-point attempt and sunk the game winner. He finished with 22 points on 6-of-14 shooting, and made four out his five 3-point attempts. Maurice Watson Jr., the other half to the starting backcourt for the Terriers, netted 17 points to go along with seven assists in the winning effort. For the second game in a row, Ike Azotam, Ousmane Drame, and Zaid Hearst all finished with a double-double. It is also the second time such has happened in program history. Azotam netted 14 points and a team-high 15 rebounds and Drame had a team-high 16 points and 11 rebounds. Hearst had 10 points and rebounds. “We just didn’t guard well enough to win against a team that’s that good,” Moore said. The first half featured a back-and-forth battle, where neither team could gain much ground. Ousmane Drame grabbed an offensive rebound at the end of the half and put it in to give the Bobcats a 36-32 advantage at the break. The second half started the same way the first ended, as Drame got an offensive rebound and laid it in with his left hand to extend the Bobcat lead to six points. He then scored a minute and a half later, when he sunk a right-handed hook and got fouled. Drame then made the free-throw, culminating a 7-point stretch from the 6-foot-9 junior. 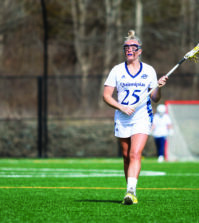 Quinnipiac outrebounded Boston University 47-27, and scored 22 second-chance points to the Terriers two. Still, Quinnipiac head coach Tom Moore points to his team’s inability to protect the rim. “When they put their shoulders down, Irving and Watson are great. They’re tough, and we just didn’t make enough stops in the second half,” Moore said. 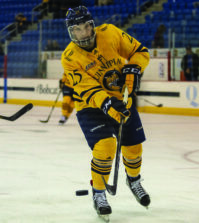 With the loss Quinnipiac drops to 4-2 overall. It is back in action at home on Friday afternoon, where it will take on Fairfield at 8:30 p.m.